We’re thrilled to annouce that date for our Annual Cancer Golf Tournament! 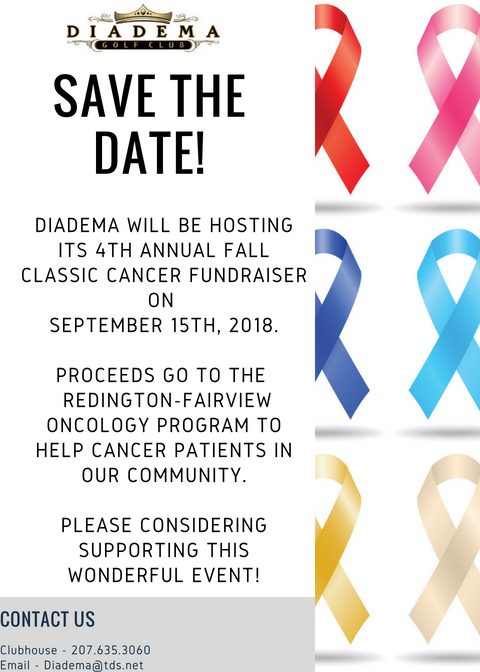 This will be our 4th Annual Cancer Fundraiser Tournament at Diadema! This is a fun day filled with great prizes, amazing food, and wonderful people! Women tee off in the AM, everyone meets for lunch mid day and the Men will tee off in the afternoon. There will be a Silent Auction run that day, full of amazing prizes from several local businesses. Proceeds from this event go directly to Redington-Fairview Oncology Department for their amazing program to help Cancer Patients with many of the costs associated with their treatment, from fuel costs in the winter, gas cards to help allay costs from travelling back and forth for appointments, wheelchair ramps to those who have lost mobility, to assisting with co-pays for medication. Last year, we were able to donate over $16,000! Please consider supporting this event by joining us or by sponsoring!